We settled down, ticked off their order chit, made payment at the counter, then waited for our food to be made. Good for breakfast or a tea time snack, there are a few standout dishes you should consider for a safe bet and here are some that we tried. For one, you can’t walk out of Victor’s Kitchen without an order of their Golden Egg Yolk Lava Bun (S$4.80) because they are touted to have the best custard buns in Singapore. The molten core quickly soaked into the base of the soft paus and tearing them apart let flow what looked like yellow grainy goodness. The butter oil had separated from the custard but that didn’t change the fact that the paus were pretty decent with a definite salted egg yolk fragrance. 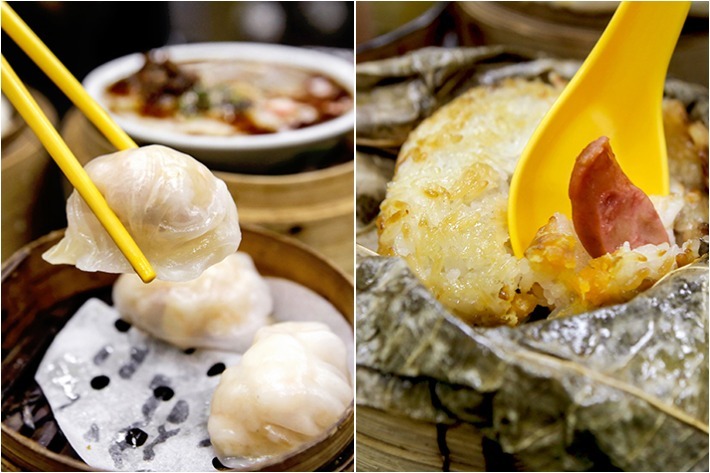 Our order of Victor’s King Prawn Dumplings (S$5.20) came as a three-piece set, each piece with a translucent thin skin that wrapped in three plump shrimps. Chicken & Sausage in Glutinous Rice (S$5.80) is a dim sum staple and this one had pretty straightforward flavours with tender chunks of chicken. Their Scallop, Sausage Carrot Cake with XO Sauce (S$4.80) is a steamed carrot cake that was almost thoroughly gooey without being cloyingly sticky or starchy. Lup cheong (Taiwanese sausage) and bits of shrimp were mixed into it. The XO sauce topping had a strong hae bi (dried shrimp) aroma and burned sharply in the back of our throats. This is one of the standout dishes at Victor’s Kitchen. Have a H.K. Summer Iced Milk Tea (S$3.20) along with your meal. The drink comes as a cup served in a bowl of ice so the drink doesn’t get diluted over time.